Join Chief Ranger Bill on Saturday, July 30, from 10 am – 12 pm for a private tour of the Connecticut Eastern Railroad Museum with TLGV member and railroad museum volunteer Ray Axelrod. For the past several years Ray has led Walktober tours on the region’s railroad history and we are delighted he will be on hand to tour us through the museum. 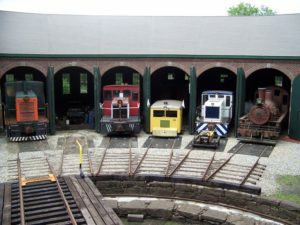 We’ll learn the history of the museum, the eastern Connecticut railroad system and view the museum’s extensive collections. Following the program we encourage participants to enjoy the newly expanded Air Line Trail that runs adjacent to the museum. Willimantic also has several excellent restaurants to consider for lunch. Join us for the morning tour at the Connecticut Eastern Railroad Museum and then make it a whole day in Willimantic. The Museum is located at 11 Bridge Street, Willimantic, CT. Admission: $7 for Adults, $3 for Children 8-12 and free for Children under 8. RSVP is required to Bill Reid at 860-774-3300 or via email at bill@tlgv.org.